(W) Shane Houghton (A/CA) Jerry Gaylord. FANBOYS IN SPAAACE! 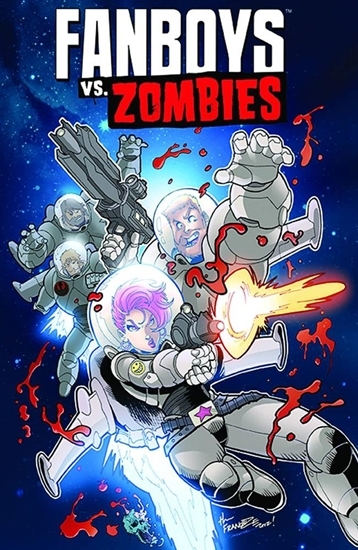 Trapped on a space station with a bunch of wimpy scientists and one rogue zombie, the Wrecking Crew is faced with an intriguing new challenge-instead of destroying Earth's zombie infestation, can they cure it? Fanboys will die. Romances will bloom. And you bet Amanda's gonna get her Ripley on! Written by Shane Houghton (REED GUNTHER) and illustrated by Harvey Awardnominated artist Jerry Gaylord, FANBOYS VS. ZOMBIES is a loving sendup of geek fandom with a perfect blend of quirky comedy and zombiekillin' action! Collecting issues 1316 of the fanboyfavorite series, join Kurt, Amanda, Rob, and Burger as the Wrecking Crew faces the final frontier-one small step for man, one giant leap for nerdkind!